We had some car trouble and were late getting out to Stanway, so by the time we arrived there was no one in the courtyard and you never notice how many doors there are on a house like that until you’re not sure which one to open. Hilary had told us that when she couldn’t find him, she simply walked around shouting “Wemyss!” until he stuck his head out of some window but even for this American (who doesn’t hold with the whole ‘your lordship’ business…it offends my democratic sensibilities) that seemed a bit indecorous. At least on first meeting. But it would have been a sight, especially if the window was one of those painted metallic gold to reflect the red-gilt color of Stanway’s Cotswold façade. I’ve never seen a more beautiful stone. We were there for the landscape, not for the house, though I soaked up all of it I could when after perusing maps and speculating about the significance of various clumps of trees we went through to the kitchen for tea. 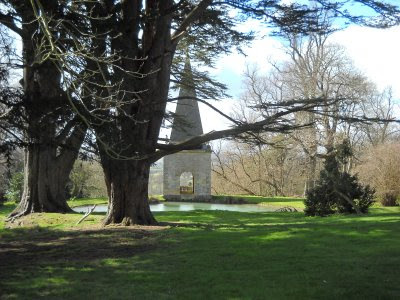 It’s a proper house, Stanway, with pale floors and dark paintings and newspapers scattered about the twin settees with pagoda canopies, and the uneven stone and settling oriel window a Jacobean pile should have. Some of England’s stately homes have been renovated until they’re pickled. 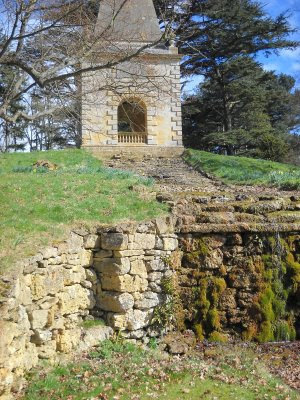 At Stanway, you can still feel the house breathing. Bridgeman on the left, Kent on the right. 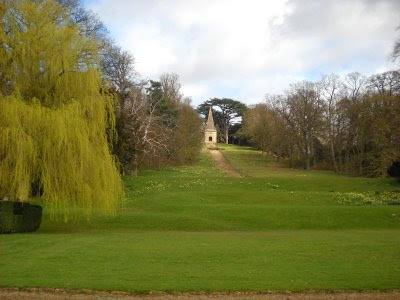 At Stanway, Charles Bridgeman’s successor in the landscape was not Kent but most likely Thomas Wright (1711-1786), ‘wizard of Durham’, astronomer, mathematician, architect and garden designer , with a fondness for Shapes of Significance like triangles and pyramids. Which is why we were there, my garden history pal Judy being something of an expert on Wright. He (if he it was) added the cascade, so that with the opening of a sluice gate water from the lake streamed down the hill to a canal at its base. The waterworks had been treated roughly over the years, and were re-excavated by the present Earl Wemyss, who once ran up the hill and struggled to open the sluice gate so Princess Margaret could see the cascade (she remained unimpressed). Not all owners of historic properties are interested in their landscapes, an exasperating but unchangeable part of practicing garden history. You can’t make someone care. But Stanway is in good hands. Not seen that before, Wright sounds really interesting. I have loved that house for years. Thank you for this post. Everything so perfect....Oh my God....Come to my blog too my dear.